Some of the world's best scuba diving is right in our backyard. On Mexico's coastline, just south of the border, you can find prime diving for all. Which destination will best suit you is the hard part, here is a brief description of four wonderful destinations for both the beginner and advanced divers. This is Mexico's largest inhabited island, and home to some of the world's best diving. Cozumel offers 18 miles of reefs, 200 species of tropical fish, and an underwater visibility of 100 feet. Most of the diving here is easy drift diving which follows a gently current. Explore the underwater caves and caverns which homes many different species of marine life. Popular dive sites: Maracaibo Deep, Santa Rosa Wall, Paraiso Reef, San Francisco Reef and Palancar Reef. This is the best place to find a variety of marine life, in fact, in this water lover's paradise, you can find over 850 species of tropical fish and other mammals such as whales, porpoise, manta rays and hammerhead sharks. Visit the breathtaking site of Sand Falls or Gordo Banks. La Paz Mexico attracts scuba divers because of it's deserted beaches, calm bays, and offshore islands. You can find more than 800 species of fish and 2,000 species of invertebrates. The best time to dive here is between June and November when the water temperature is 80 degrees and the visibility is great. Swim with hammerhead sharks and sea lions at many wonderful sights, such as, Los Islotes, Salvatierra, and El Bajo. San Carlos is a popular destination for Arizona residents looking for a quick diving getaway. San Carlos is becoming a more populated resort destination. 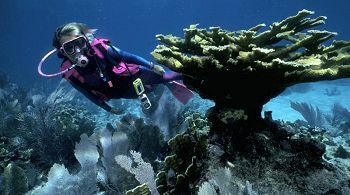 Divers can enjoy the warm water in the summer and the abundance of marine life. Popular diving spots: explore the wreck of the tunaboat, San Pedro Island, and the Diaz Ordaz. Best known as the Mexican Riviera, the Pacific Coast boasts some of the most beautiful beaches in the world. But don't believe there is no diving here. There are a number of excellent dive centers with the local knowledge to team you up with a great experience. The best season to dive in Mexico's Pacific coast is between August to February. From March to July the visibility is reduced from plankton blooms.